Last night I arrived home from the opening meeting at BJU to find my beautiful red head in distress. Turns out Thing Three had a fever. She always feels bad when the kids get sick on a day that she has to teach. Part of it is because she doesn't want to cause me to have to miss work. However, I think another reason (a main reason) is that she is a mother and she wants to be there for the little guy. It doesn't bother me too much. I hate to eat into my sick days, but it does allow me to get some things done around the house. With all that is going on this weekend, that is nice. 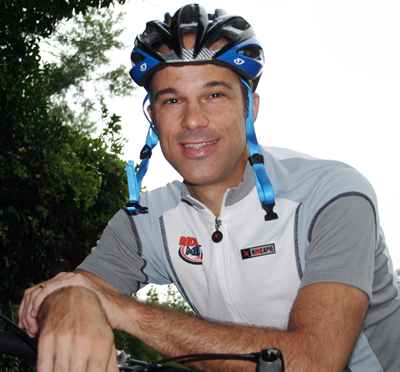 I did some work from home, cut the grass, and worked with Steve at The Greenville News to get my cycling blog set up. It is done now. I've just got to figure out how I'm going to work these two. At 2 PM I watched the press conference for this weekend's events. The poor emcee had an awful time getting the cyclists to answer his questions. It didn't help, of course, that he was asking them "yes" or "no" questions. Around 4 PM the wife came home and I decided to break my rest day and go for a ride. All this cycling stuff and being stuck at home was making me antsy. I was supposed to be at a reception for the cycling stuff by 6 PM. So, I hoped on and headed downtown and then looped around over Paris and then home. I pushed early up the mountain and paid for it later toward the top. It didn't help me any as I climbed it in 14:56. The last time I climbed it I made it in 14:46. That time I paced myself. Proves that sometimes measured and easy wins the race and I felt a lot better at the top that time as well. After a quick shower, I headed to the Wyche Pavilion for the reception. There were supposed to be some pros there. The only one that I saw during that time was Saul Raisin. Still, I met some neat people for the first time and got reacquainted with some others I hadn't seen in a while. John from Sunshine Cycle was there with his lovely wife. Rob, a classmate of Leadership Greenville, was there. I didn't realize he rode. He was there with his wife who I learned works at Carolina Triathlon. Now, that is a nice setup! Getting shop discounts from your spouse! After a bit I headed out to the WYFF activities. I couldn't stay long because I had to get home to the kids since my wife was going to the second meeting at school. Tomorrow night we will be all home together and I'll be glad. I ran into Dave Shields selling his books. That was pretty cool. I ended up buying his three cycling books as well as a book he wrote called, "The Pendulum's Path." I'm not even sure what it is about... just a fiction novel. I looked around to get Saul to sign my copy of "Tour de Life", but he was gone by the time I bought it. You can look for reviews here in weeks to come. George was there at the WYFF event, Zabriskie was there, Raisin was there, but I didn't see any other pros about. A funny part of the show was a segment with Geoff Hart riding his bike up the Furman side of Paris Mountain. I'm not sure how long he said it took him, but it was a long time! Then he had George up there later and he asked Hincapie how long it takes him - 8:30! After celebrating 14:46 the other day, I realize just how amazing these guys are. By the way, Dave Shields had nothing buy good to say about Greenville. He said he was here last year and was excited about getting back this year. That seems to be a recurring theme. Once people can experience our great city, they keep wanting to come back. Here are my stats for today: AM HR/WGT: 56/170.2 and PM HR/WGT: 76/170.5 I do notice that on the days that I ride, my evening resting heart rate is higher (by about 20+ beats) than on non riding days. I also learned that I lost almost the same amount of weight while riding today as I did last time - 171.6 before and 166.5 after. I mentioned that there would be a change coming up soon. I think I can mention it now though it won't be active until later Friday, August 31. I've been given the opportunity to blog in our local paper's Web site greenvilleonline.com. Cycling will be the topic, of course. I'm a little nervous. I don't want to come off as I'm setting myself up as the person who knows everything about cycling in Greenville. I'm not! There are lots more people up on the scene than I. However, I'm learning more each day and have a track record of being a pretty consistent blogger. Hopefully, the more serious biker types will be accepting. I also picked up a new helmet today. I've been looking at this one for some time and it went on sale for the weekend. I can't wait to take it out for its first ride. Unfortunately, that wasn't today. The weather was bad - people have been struck by lightening - and I had an event to attend this evening. I also won't get to ride tomorrow evening - but that will be because I'll be hanging out with the pro riders at the sponsorship reception downtown. Good times. Ah, my stats for today. AM HR/WGT: 64/170.9 and PM HR/WGT: 60/172.6 My heart rate was a little higher this morning because my wife put, Pippin, my male cat on top of me in bed to wake me up. He didn't like that to much and as he jumped away his rear claw (he doesn't have front ones) scratched my face. I wouldn't exactly call it a resting heart rate! Here is my new helmet and the picture that I think they may use as my header for the cycling blog. I've started reading Lance Armstrong's War. I'll give a review of the book when I'm done. Honestly, it has been hard getting into it. After all the doping and reading David Walsh's book, it is hard to not look at Lance (and this book) without a little skepticism. I think I should be able to let you know soon of another opportunity I may get to write about cycling stuff. I should know more tomorrow and I'll give you a heads up. It really won't change too much of what I am doing now - just give me another avenue to spread the word about cycling and, I hope, open some more opportunities for me to meet more people in the Upstate cycling scene. Oh, and here are my numbers for today - Morning weight/heart rate: 169.8/53 and Evening weight/heart rate: 171.6/58. Two days now until the Time Trial. Three days until the Road Race and P3 Ride - my Ride for Mike. Weather wise, things are looking pretty good. How does highs in the low to mid 80's sound! There is some chances for thunderstorms, but most likely those won't get in the way. I went out today and bought a scale to weigh myself. The last time I was weighed was several months ago when I had a medical procedure done. I was 175 (on a 6' 2" frame) at that point. However, the training stuff I read says you should keep a journal of your weight and resting heart rates so you can get a handle on whether you are training properly or not. For fun, I weighed myself before heading out on my ride tonight: 172.8 pounds. Okay, that seems about right. Now, off on the ride. I decided to leave from my house and head up over Paris Mountain and then back home. That would give me about 20 miles. I took one Polar bottle of water and my GelBot bottle with some Hammer Gel in it. I figured that would be plenty. The temperature was around 86 degrees when I left and by the time I reached the upper elevations of Paris, I'm sure the temp dropped into the lower 80s. It felt pretty good. I focused on keeping a high cadence and my pedal form. The idea is to keep the legs going up and down and not have your knees go out away from the frame on the up stroke. I find myself doing that especially when I am tired. I did increase my average cadence to nearly 10 rpm over my normal average. Frankly, as I started up Paris and came to "The Wall" - a section that has about a 12% grade soon after you start the climb on the State Park Road side - I didn't think it was going to be a very good night. I had pushed so much the night before that my legs didn't appear to be that happy. However, by the time I got up to some of the "flat" sections, I was feeling pretty good and cruising along at about 22 mph. Then as I made the last climb to the KOM, I was feeling really good. My legs were happy and my heart rate was just over 180. Coming down the Furman side was kind of scary. Normally I let it go and enjoy carving up the road. Tonight there was sand everywhere. I guess they have been cleaning the shoulders in anticipation of the race this weekend. Unfortunately, it has spread sand on the descent. It won't bother the race because they will be going the other way. However, remembering my wreck a couple of weeks ago, I didn't want to take my chances on sand! As I descended, I passed some riders going the opposite direction. At about that time, my GelBot fell out of my cage. I decided to just pick it up on the way back. I wanted to get down and start back up in hopes I would catch at least one of those riders. I reset my lap point and headed up the Furman side. My legs really did not feel like I had just ridden 11 miles over a mountain. Things were looking good. Before long I came across the bottle and I stopped to pick it up. Then back on it. I kept looking ahead hoping to see the riders. Nothing. My speed stayed between 7.5 mph and 12.8 mph. Mostly I was staying in the 8 to 9 mph range. It wasn't easy but I knew I wasn't going to bonk. Finally, I turned around the last right hand curve onto the straightaway before the final left hand turn of the climb. There was the last rider of the group. I came up behind him, moved into a smaller rear ring, stood up and moved around him. I stayed up and kept pushing until I reached the top. I looked down and saw I had climbed the mountain in 14 minutes and 46 seconds. It made me wonder what time I could have gotten had I not stopped to pick up my water bottle. After that, I didn't much care to push any further. I just enjoyed a spinning ride home. When I got back, I got on the scales again: 166.4 pounds. I had dropped over 6 pounds on the ride. Obviously, it was fluids. It is amazing to think you can sweat that much out of your body! One thing I have learned from that is the importance of being hydrated! I typically drink 64 to 80 oz. of fluids each day - and then carry up to 40 more with me on the bike for an hour or so ride. What does that mean? Well, when I first started riding my bike, I had set a goal to average 20 miles an hour for one hour doing laps of Cleveland Park. It is a 2.5 mile loop that includes a good mix of terrain. You have flats, climbing, and some downhill. For months I was stuck in the 19 mph range. Then finally on the day I got my new wheel set, I broke 20 mph with a 20.2 average for one hour. Tonight I went out and decided to try to do it again. It has been over two months since I broke the 20 mph mark. Other routes and just not being able to pull it off have kept me from breaking the barrier. I noticed that it was harder to break the mark once I got the Garmin. I figured it might be that it measures things differently than my old computer. Anyway, to make a long story short, I did it. I averaged 20.3 mph for one hour. I think I'm going to have to set a new goal. It would be something to aim for to hit 20.5. That doesn't sound like much until you go out there and try to do it! I did two cool down laps with Chris, Sherri, and Amber. It was Sherri's first time out at Cleveland. Up until this point she has been doing her riding in parking lots. That first climb was an eye opener! Still, she did well. Before she knows it, she'll be taking off with Amber (Amber left us all and took off ahead). My friend Jeremy also got a bike last week. He has a newer Allez. It is a nice understated metallic color. I like it a lot. Now we just have to find a time to ride together. Something tells me he will be an animal. He is a tri guy. He is pretty fit. I was watching the Sharpie 500 last night and didn't check my fantasy points except very early in the race. Hamlin went out real early and Busch (Kyle) was basically no where to be seen. Gordon was coming and going to the front and I really thought he might find his way into a top ten. That was before everything started going away on the car and he had his rear end wiped off by Michael Waltrip. In the end, Gordon finished 19th or 20th. Hamlin had a DNF over 200 laps back. Kyle, the invisible man, ended up pulling off a top ten. I figured I was toast and that BBuck had picked up another race on me. Well, that wasn't the case! This morning I checked the scoring and I won against Draftingwithyates. Super_D scored the most points (Kurt Busch, Clint Boyer, and Ryan Newman) and beat A_Junior_Fan. BBuck stays close with an easy win against the wild card team. Only a couple races left to the chase. I hope Gordon is able to get through this bad luck and maybe get a win. California is a mixed bag for him. We'll see how he does. A win sure would help when it comes time for setting up the chase order. I did ride today. I put in 30 miles just going from my house to Cleveland and riding around. I tried to find some new routes and ended up getting lost in Nicholtown. I wound up over at Greenville Tech! It was actually kind of fun to be exploring. However, the neighborhood isn't the kind of place a white guy in tights wants to get caught! Another embarrassing thing was that as I was getting ready to set out, I was adjusting my Garmin. The handle bars swung suddenly to the left. When the wheel got perpendicular to the frame, the front wheel rolled and I got slammed down to the ground on my left side. I got a small, annoying cut in my hand that stings when sweat gets in it and a bruise on my left hip. Bike is okay -- it was my pride that got hurt more than anything. I'm not even sure anyone saw it happen. My plan is to ride tomorrow and Tuesday. Wednesday I'll take off. Thursday I'll have to do some spinning because I have meetings that will keep me from getting out for a long ride. Friday I'll take off. Saturday I'll do my normal Sunshine Cycle Shop ride and then Sunday will be the P3. I hope they will change the time for the P3 in the future. I won't participate again if they have the ride on Sunday. The funny thing is, I signed up this year thinking it would be like in the past (a Saturday ride). I didn't even think that September 2 would be a Sunday. It wasn't until I had signed up and started my fundraising that I realized that date was Sunday. It is a great cause, but I'll have to find another fundraising ride that does not violate my conscience in the future. My thoughts on the book, From Lance to Landis: Inside the American Doping Controversy at the Tour de France by David Walsh. Perhaps the part of David Walsh’s expose of the doping culture in professional cycling – and American cycling in particular – that gripped me most was the author’s note at the conclusion. Here in a book published before the 2007 Tour is an afterthought that mentions an event that would help turn that Tour upside down. Walsh writes, “Four years ago, I traveled to Milan to meet a young American who had recently moved from Colorado to Italy. He told a story about a friend of his, a European-born professional cyclist, who had asked this young man to bring to Italy a pair of favorite cycling shoes he had unintentionally left in the United States.” He explains how that the young man agreed to help his friend, but he had to open the shoebox in order to fit the shoes into his luggage. The rider? You already know his name, Michael Rasmussen. If you paid attention the Rasmussen affair during the 2007 Tour de France, then you have experienced Walsh’s book in miniature. All the conjecture, his word against some other person’s word, protestations of “I have never tested positive,” and no silver bullet are all part of the book. Walsh puts his focus, not on Rasmussen (who is not mentioned at all in the book), but on Lance Armstrong. He connects the dots of conjecture, brings in the interviews of those Lance will tell you are only trying to bring him down, tries to show that indeed Armstrong HAS tested positive, but in the end he offers no silver bullet. Does he plant some doubt? You betcha! How does he do it? He builds a very strong case from interviews and actual events to show the culture of doping in professional cycling. He then shows how Lance fit in the profile of those who doped. He also makes compelling arguments to show the need to dope in order to be competitive in the sport. The jump in speeds of the tour during the time EPO was introduced to the sport and the way it was measured by those clean cyclists who dropped their jaws in amazement as last year’s human riders left them in the dust just 12 months later. I want to believe in such teams as Slipstream and those riders who have come out vocally opposed to the culture (and so does Walsh). To me, the danger for cycling is not the doping, but the lack of trust that the dopers have created. Do I want to get behind a team like Slipstream? Do I want to believe young riders like Craig Lewis will avoid getting sucked into the culture? Who can you trust? After reading From Lance to Landis, I’m going to have to let some time pass before my level of trust will return. I'm not feeling too well. I didn't ride last night and I don't think I will ride tonight either. I have a head cold that makes my nose feel like a lead weight on the front of my face. My throat is sore and I feel simply miserable. It started hitting me Saturday afternoon (while my body was weak from the ride?) and has picked up some steam these last couple of days. Thankfully, it normally feels worse in the mornings and evenings. I'm able to function alright during the day. Maybe this is God's way to making me stop so my body can recover. Today Kirk, Brian, and I left Cleveland Park this morning around 7 AM and headed up for Caesars Head State Park. I'll tell you, I was a little apprehensive. I have climbed the route before, but after leaving from Slater-Marrietta which is much closer. I ate a Power Bar and a bowl of cereal before leaving the house. I had my two Polar bottles and two smaller bottles full of water. I had the two smaller bottles stuck in my jersey along with two flasks of Hammer Gel (Raspberry) and my phone (in a plastic bag along with my license and debit card). Feel like climbing 2000+ feet in a distance of about 6 miles? What a beautiful day for a ride! When we started out it was 75 degrees. That early in the morning there was hardly any traffic. We just enjoyed the morning and looked forward to the climb. As we came onto the Furman campus on our way, we ran into a kids tri there. I saw a couple of friends who must have had their children participating. From there it was pretty uneventful. The one thing that brought some interest to our ride during the nearly 30 mile trip was the "virtual partner" on my Garmin. You can create courses and embed in them data about another rider - for instance the average speed. I had him set at 17.5 mph. We actually kept up with him pretty well. We ended up naming him Miguel Indurain. He kicked our butts for the whole course finishing well ahead of us. Then it was time for the climb. I started off too hot (just like I normally do) and by the last two miles, I was slipping back from the Flinte brothers. I ended up finishing the climb in 46 minutes (about three minutes behind those guys). As you can see from the chart above, the incline winds up about 2000 feet in 6 miles. If that wasn't enough, there are portions with a 24% grade. Of course, that makes it fun coming down! How great it felt to be rounding a curve and see those poor souls who were climbing where we had just suffered. How quickly you forget the pain when you are flying down that road. Actually, by the time we got to the bottom I was feeling pain. My shoulders and neck were stiff. I am stilling dealing with the effects of the Thursday night crash. Coming downhill, I was tucked low with my neck bent so I could look for the next curve. I was hurting pretty bad. Even as I type this, I feel better but still have pain when I lift my right arm above my shoulder. Coming back we were just wanting to get home! We stopped at least three times to get water or Gatorade. The temperature had risen to about 88 degrees, but more than that we were just bushed! About five miles out, I started cramping. Cleveland Park could not come too soon! I made it! I almost felt like laughing, but that stopped as I found that when I went to push the accelerator on my car, my leg would cramp! I made it home and just laid down on the floor and my wonderful wife massaged my legs. I then got in the shower and just let the warm water work on my muscles. I'll recover. However, I'm finding that it takes a little more time than it used to. I guess I'll have to start counting the cost of what will happen after I do another one of these types of rides. For now, the pain and cramps start to fade in my memory and I just think, "I did it!" Tomorrow morning Kirk, Brian, Chris, and myself will start out for Caesars Head from Cleveland Park. The ride will be about 71 miles. I'm going to be loaded up with plenty of carbs, calories, and water. Here's hoping the weather will be kind. There are a couple of "maybes" signed up, but I really don't expect there to be anyone else joining us. Chris is going to have to turn around about an hour into the ride, so it will only be three of us going all the way. It should be about 73 degrees when we leave. It will be getting close to 90 degrees by the time we get home. The key will be not trying to push things. There is no need to be in a hurry. I know someone who was in a hurry today, Jeff Gordon! He took the pole in Michigan. I'm going to run Gordon (1), Kyle Busch (6), and Hamlin (8). It's going to be a showdown since I'll be going up against BBuck. If I win, I gain. If I lose, he gains. At least, he'll have to come from behind with his drivers Edwards (13), Harvick (28), and Stewart (35). Of course, as they say, that's why they do the races. I was able to make it out with the Sunshine guys tonight. We rode a route I had never ridden before. Most of the roads were unfamiliar to me. That fact led to an eventful ride! First, I'll point out that I got my Garmin back on the bike and gave it its first road test. It passed with flying colors! The elevation readings were awesome! I was able to see the grade of the road as we rode along and all my data synced right into my current system - well almost. The Garmin Training Center didn't like the fact that I had a different serial number and wanted me to create a new user. I'll just download the history from Motion Based and bring the data up-to-date. Motion Based took the data without a problem. Well, as we were riding along, somehow I ended up front (remember, I didn't know where we were going). As we approached one road I heard, "Turn right! Turn right!" I looked back to see where they were and then looked up to take the next right. I didn't realize that there was a fine layer of sand spread across this road. As I turned in, the bike went out from under me. It was kind of like sliding into second. I didn't even get a chance to put my hand out (I'm actually glad because I didn't have on gloves). 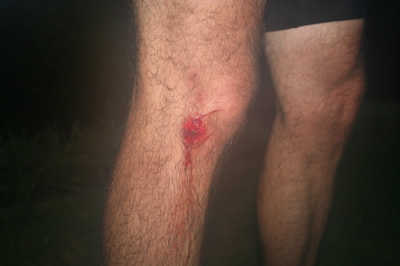 I came down on my right leg and right shoulder. I have a really nice strawberry on my leg (I refrained from uploading the close ups) and a burning road rash on my right shoulder. I didn't feel this until I got home and cooled down, but I have a stiff muscle in my back. Excuse the blurry picture. We brought the camera out of the air conditioned house and the lens fogged up. Man, I am going to have fun trying to sleep tonight. The strawberry shouldn't be a problem but the road rash is going to be annoying. Still, the fun of the ride was worth it. 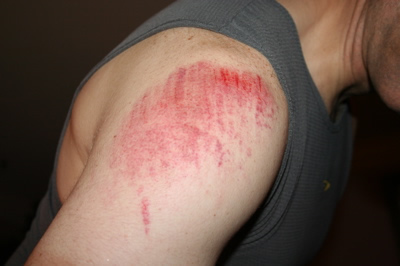 Besides, that was my first crash on my bike. Now I've got that out of the way. Interested in seeing how my Garmin is doing? Check out my MotionBased.com dashboard. Three cheers for Garmin support! I got my Edge 305 back today - actually, I got someone else's Edge 305. Either way, it is back and it is working - as far as I can tell. I sent the device to Garmin support on Wednesday of last week. They received it on Friday and I just got it back this afternoon. So, it was a total of a week counting the time it took me to ship it to them. Not too bad. However, when I read the report that came with the device, I discovered that they replaced the device I had with a new one (new to me - I believe it is a refurbished one). I really can't tell any difference in them, other than the new one appears to be finding the elevation. I was able to get the device calibrated, paired with my heart monitor, and synced with my computer with no problem. I did have some problem with getting it paired with my cadence monitor on the bike. Turns out the battery was dead. Once I replaced it, the two paired up right away. The real test will come when I take it out riding tomorrow evening. I'm thinking about doing the Thursday night Sunshine ride since I won't be able to go out with the boys on Saturday morning. It is the big Cleveland Park to Caesars Head ride that day. I'll keep you posted, but my initial grade for Garmin support is an A. If they would have shipped me a device and then allowed me to ship the defective one, that would have gotten them an A+. Just a quickie to note that I put in 20 miles tonight. After Saturday's ride, I was having some constriction in my upper chest - not my heart, but my respiratory system. I decided to take it easy tonight. Frankly, after the heat we have had it was very nice. There was some cloud cover - but not to much as well as a light breeze. The temperature seemed to be in the 80s. Maybe is just wasn't as humid. Whatever the case, it was a beautiful time to ride and I enjoyed hitting Cleveland Park with friends. It was just the way it should be. Before I walked into church tonight, Gordon was leading at Watkins Glen as the red flag was lifted and the race was restarting for the final laps. Gordon + road course * 10 laps = victory. When I walked out of church I learned that Gordon lost and to make matters worse, Stewart won. I didn't know exactly what happened until I got home and then it was REALLY bad. Gordon spun out with two laps to go while he was in the lead! He still managed a top ten and I bet he is kicking himself big time. Hamlin also finished up in second. So, with Mears getting a top 20 finish, I was able to rack up 436 points to give me the highest point total for the race (wasted on thewildcard - 34 points). BBuck held on to second place with a 35 point win. Super_D added another solid win over DraftingWithYates, but he is still in last place four races behind DraftingWithYates. I am a data hound. The more I can know about something I am interested in, the happier I am. However, last night while riding without a computer on my bike for the first time since I've started riding, I found an amount of freedom that reminds me that sometimes the data hound is chained to a tree. We rode around 35 miles that included two times over Paris Mountain - to the Furman side and then back. It was hot! We stopped once at a station, turned on a hose, and doused ourselves. On one stretch, the five of us had a really good pace line going. We sustained a 28 mph average for several miles before we ran out of road. That was probably the most fun I've had on a bike in awhile. It is a lot of fun to ride together than against each other. Climbing up Paris Mountain on the way home, I think I saw Gene and Terri Bucholtz. They were moving along with Gene wearing his Assault on Mount Mitchell jersey. Terri was on a mountain bike. Wow, she is going to be in shape! I miss not having my data now that I am off the bike. However, it made me listen to my body more while I was in the pedals. I'm not even sure how to explain it, but something about having a computer makes you ride to the device - to the data it gives you - rather than just riding and listening to the clues your body gives. Ultimately, I'm not sure which way I like best. As with most everything in life, I probably just need to find a balance. Yesterday, I sent off my Garmin Edge 305 for service. I'll record here how things go with Garmin support. So far, I have been pleased with it. The last email I sent received a response within four hours. I shipped the device yesterday by UPS two day air. It should arrive at Garmin on Friday. They say it will be 10 to 14 days to get it back. Here's hoping it is closer to 10 days. A funny of sorts... I went into Sunshine the other day to pick up my bike that was being serviced. As I walked in, Mike said, "We were just talking about you." Actually, it wasn't so much me as my name. It appears that while I was riding last week, I came across the Thursday night Sunshine ride. As we passed in opposite directions Mike asked, "Was that Pait?" "Yeah, that was Pait," one of the shop guys replied. Then someone in the group said, "Does he live here too?" Now that means nothing to you unless you are familiar with American cycling and the new cycling team Slipstream. One of their better riders from the TIAA-CREF days is Danny Pate. The rider thought that in addition to George Hincapie, Greenville was now home to Danny Pate. Sorry to disappoint! When people spell my name P-a-t-e, I always say, "It's P-a-i-t. The other Pates are the rich ones." Somewhere back there we are all related. I have a cousin that did a huge book on our family tree and it all goes back in America to the 1600s to a guy named John Pate. Somewhere along the way (around the time of the Civil War) the Pait set branched off. There are all kinds of interesting theories as to how the change came about. If that is not enough, don't forget the Paite clan - they are our long lost cousins as well. If you are planning to ride the P3 Ride on September 2nd, you might want to read this. If you aren’t, go on to something else. This is my blow by blow account of each segment I rode on the USA Cycling Pro Championship Road Race course. What I am hoping to do is average just under one hour and fifteen minutes for the first two laps and then ease off and complete a third lap in one hour and thirty minutes. You have to do the first laps that fast because the organizers will cut off any riders who approach the start/finish after 9:30 AM (the ride starts at 7 AM). So, you have to get those first two laps done in two hours and thirty minutes. Then you have until 11 AM to get that last lap. I went out alone at around 6 PM. It was 98 degrees as I left and upon my return an hour and eighteen minutes later, the temperature had only dropped to 93. I’m certain that played a role in some of the struggles I had. That is a positive looking toward a 7 AM start time. Segment 1: I left the intersection of Broad and Main and headed to the base of Paris Mountain. I ended up with an average a tick below 19 mph. This was a stretch of nearly 8 miles. I was really pushing it knowing that this was rolling roads and I hoped to build up some time to “give” when I started to climb. Frankly, I think I overdid it and it hurt me later in the ride. Best scenario for the ride is that I get in a group and we work together. I was banging at about 185 bpm on my HR. Don’t need to do that. 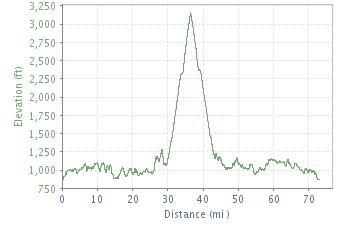 Segment 2: This segment starts at the base of Altamont Road and covers 2.25 miles up to the KOM marker. In that distance, you climb nearly 1000 feet. I have pulled out a 9+ mph average on this climb, but if I try that I don't think I'll get the time I need on the second lap. This ride I actually had to use the climb to recover from segment 1! My average was just over 7 mph. 18:06 m:s is nothing to write home about, but considering I was trying to pace myself and keep my HR low (kept it below or around 180 bpm for the climb) I feel pretty good about it. Segment 3: Starts at the KOM marker and heads down Altamont to the light at State Park Road. It is a distance of 3.80 miles and if you don't kill yourself climbing in segment 2, you can really get some time coming down. Unfortunately, I had gear problems and had to fight that as I descended. I averaged 24.6 mph with a max speed of 44.1 mph. My HR dropped from an average of 180 bpm in segment 2 to 159 bpm during that time. It took me 9:16 m:s to get off the mountain. Segment 4: It is a minor climb from the light at State Park Road to the top of Piney Mountain Road. It is less than a mile (.66) and even on the climb I was able to hit 21.5 mph. My average speed in this segment was 15.5 mph. After Paris the heart was happy with a max of 172 bpm and a climbing average of 164 bpm. I was at the top in 2:33 m:s.
Segment 5: This is a moderate downhill that goes from the top of Piney Mountain Road to the light at the intersection of Piney and Pleasantburg. It is roughly the same distance as the climb (.64). You are down before you know it - 1:18 m:s. I hit a top speed of 38.9 - basically without pedaling, but just tucking and coasting down. My heart rate dropped again to a 159 bpm average. Segment 6: Pleasantburg, right on Rutherford, left of Main Street. This is a segment where I think you can pick up some time. The downhills are good for time, but there is only so much speed you can get. On this section, you can earn some time pedaling and if you still have a group together at this point, I bet you could pick up half a minute or more. Unassisted I averaged 20.3 mph in this rolling segment. On the last downhill portion, I maxed at 32.6 mph. In the 5:55 m:s it took me to complete this section, I had an average HR of 164 bpm with a top bpm of 177. Segment 7: This is a short segment that includes the last "big" climb on Main Street - it seems big because of what you have gone through to get there! It starts right after the top of the first minor climb and continues to the intersection of Stone Ave. and Main Street. It probably shouldn't be its own segment, but that climb kind of sets it apart and you need to be prepared for it. It will only take you about 2 minutes to cover the .61 miles. Segment 8: I call this the downtown segment. 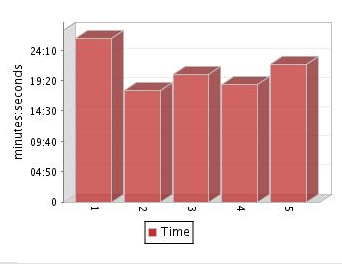 This is where if you are riding for training you can see your time go down due to the lights. In this case, it wasn't so bad. There wasn't that much stopping. This segment starts at the Stone Ave. and Main Street intersection and follows the "urban" portion of the course to the entry of Cleveland Park. It took me just under 7 minutes to complete this section. I bet you could take 30 seconds to a minute off if the roads were cleared for you. I averaged 17.6 mph and got up to 37.6 mph as I approached the park. My heart was recovering and my average was back to 160 bpm. Segment 9: This is the Cleveland Park segment. It starts at the entrance of the park off of East Washington. This is a time when you feel good -- the riding is easy enough and you know the end is right around the corner. There are the slight climbs on Woodland Way Circle and East Broad, but I was still able to average 18 mph in this segment. I was pushing it a little to cover the 2.35 miles in 7:51 m:s. I moved my heart up to a max of 181 bpm and averaged 171 bpm. So, overall, I finished in 1 hour and 18 minutes. In order to get a chance to do three laps on the day of the P3 ride, I will need to average under 1 hour and 15 minutes the first two laps. Then I will have 1 hour and 30 minutes to do that last one. My average of 16.8 over 22.03 miles, is just a little short. I've got to pick up a mile per hour more on my average. Can I do it in 1:15? I really think I can. There are a number of places where I could pick up time if I pushed just a little. Plus, the roads should be clearer and if I can just connect with some riders who have the same goal I do, we should be able to work together to get more speed with less output. At least, that is my plan! I love my Garmin Edge 305 -- except for one thing, the altimeter does not work. It constantly reads 5135 feet. I have reset it, reinstalled the software, and sat it outside for over an hour trying to recalibrate the thing. No go, it just won't work. After contacting Garmin for the second time, I got the following message from Garmin support. I will email you the address and your RMA number to have the unit shipped back to us for the warranty repair. From the time that we receive the unit, we should have it back to you within 10 days as we will ship it back to you Second Day Express. Ten days! Let's see, I really need the device tonight, so I will have to send it out tomorrow. If it takes two days to get there (that would be Aug. 10) then I would most likely get the device back a couple of days AFTER my Caesars Head ride. :-( However, the good news is that I should have no problem getting it back before my Ride for Mike. There is even a chance that it will get back to me the day before the CH ride. BBuck pulled off right at the very end. I thought Draftingwithyates, was going to beat him (which would have been good), but right at the very end BBuck pulled it off. That means that BBuck moves into sole possession of second place in the league. Draftingwithyates and A_Junior_Fan are now tied for third. So, BBuck has now cut my lead to 5 with only 5 races left before the chase. The good news is that Gordon is still churning out top fives and Steveo will be back on the box next week -- which, I should point out is a road course. Wouldn't you know it? It will be wasted on the wildcard team. Yesterday I got a Facebook wall post from Dave McQuaid. He was asking me if I had heard that the cut off time for the P3 was set for 9:30 AM. I went looking on The Greenville News site and couldn't find anything, so I hoped over to P3Ride.org. Didn't see anything there, but as I was looking for it, I came across the following picture. 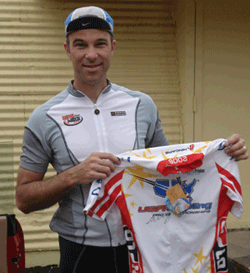 This is the George Hincapie autographed jersey that I got during the second fund raising blitz. The autograph isn't real clear - the ink is kind of faint and it runs into some of the jersey color. Still, I didn't raise the money to get a jersey! I'm still deciding what to do with it. It is a small, so I can't wear it. What do you typically do with these sorts of things? I was disappointed to learn that the cut off time was 9:30 AM (the ride starts at 7:00 AM and you are supposed to finish as many laps as you can before the cut off). That means we have only 2.5 hours. I will be PUSHING it to get two laps! We will need to average 17.6 mph. The last time I did two laps of the course, I averaged 15.7 mph. As I was working on this post, I got a message from Dave letting me know that the cut off time is 9:30 AM, BUT if you make the cut off, you can go ahead and finish your lap with the course closing at 11 AM. That is a little better. There is a chance we could get in three laps (about 66 miles - a metric century). Still, I hope next year that move the ride back to Saturday. Having such a short ride with the time pressure takes a lot of the fun out of the ride. At least from anywhere I have a Sprint data connection. Thankfully, Sprint is beginning to roll out their EVDO network in the Greenville area. So, I am able to connect to the Internet from my laptop by forming a Bluetooth partnership using my HTC Mogul phone running Windows Mobile 6. Folks, this is cool! It isn't like sitting home on my wireless network, but this ain't bad. This particular test was using the typical cell connection. 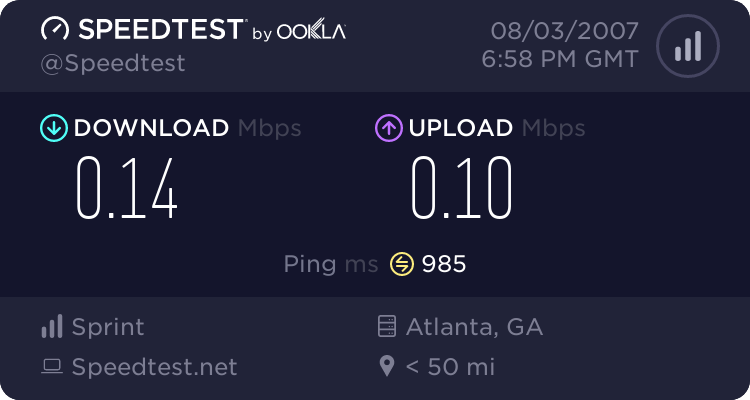 In some places around, I can even get better speeds. Right now, I am sitting in the lobby of the BJU HomeSat building waiting for some new employees to come out of a tour. I've checked my work mail and checked some sites and then decided to try the speed test you see above. I am sore! Last night was interval training night on Paris Mountain. That means I start at the base of the mountain and climb about 1000 feet in 2.25 miles. The first, third, and fifth laps are "easy" laps - I attempt to simply spin up the mountain and try to keep my heart rate down. Laps two and four are "hard" laps - I push myself (still setting a cap on my heart rate so I can learn to control it). Well, the first lap, I was good and did what I was supposed to do. The second lap, I did push it, but I started focusing on the speed of my climb and did not cap my heart rate. I went into the 90 to 100% range of my max heart rate. From there, it was "down hill." On the third lap I did ease off, but didn't work to keep my heart rate low. One of the reasons was there were lots of riders out there last night. I either rode up with other riders or got caught with the desire to pass those up ahead. I kind of destroyed my discipline! I had climbed four times before, but this was the first time to do the fifth one. It was hard. Now this morning I woke up and my whole body was sore. I guess it pays not just to train, but to train right. Hopefully, I learned my lesson! I wonder if we might need to call ourselves fools in this Blogger/MySpace/Facebook culture of today. We claim transparency as a great virtue -- but so is discretion and knowing when to hold back. Then again, are those who open their lives truly being transparent? Are they simply creating a world as they wish people to see?